Other Observers: none; First reported 30 May by Ted Floyd, then 31 May by David Waltman. Riparian Strip with bordering residential area to east and wet meadow to west. Light: Overcast, fairly even light against canopy but backlit when seen against sky. Moderately small, overall brown-toned bird. Most prominent features are whitish supercilium in a darker brown cap, longish curving bill, buffy underparts, barring on wing and undertail, and pale throat. Behaviors: Bird was singing and foraging in mid-canopy along S. Boulder Creek. Call: Repeatedly singing repeated chanting "teakettle" phrases. Song had a resonant, load character overpowering other nearby singing birds (like Yellow Warbler.) Sound audible on video taken of bird. 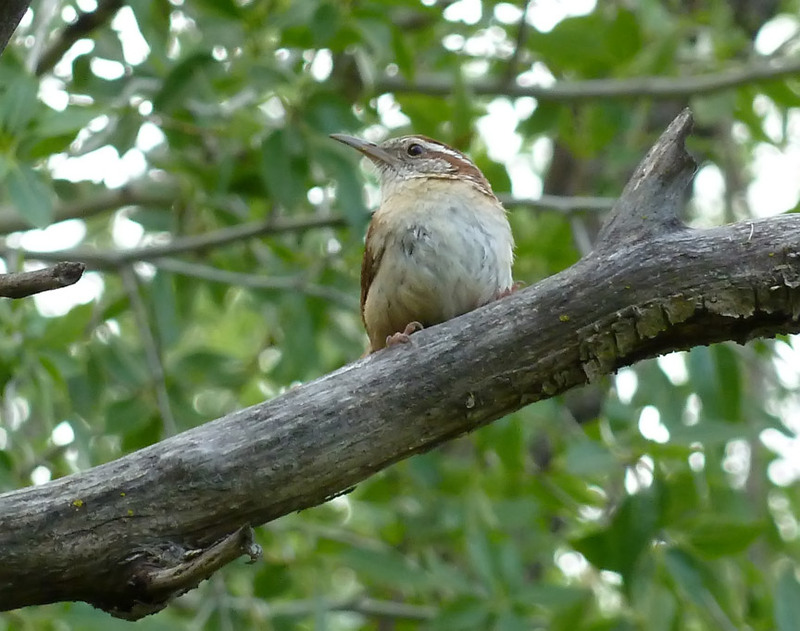 Bill, body structure, and color patterning typical of NA wrens. Larger and longer-tailed than House Wren. Song diagnostic for Carolina Wren. I've seen only one other Carolina Wren in Colorado but have seen and heard many others in my travels to more southeasterly states. Other Dates: First reported 30 May by Ted Floyd, then 31 May by David Waltman. Independent Observers: First reported 30 May by Ted Floyd, then 31 May by David Waltman.